Alex Bilokur has a taste for high stakes poker action, and has done quite well for himself despite not calling himself a professional player. 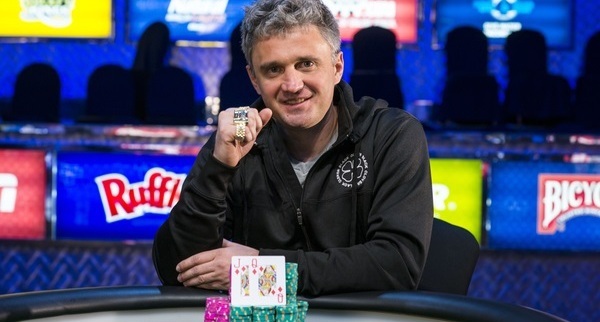 In recent year’s he had accumulated nearly $3 million in live tournament earnings, but he finally achieved his true aspiration when he topped the 160-player field in the 2014 World Series of Poker $10,000 pot-limit hold’em championship event to win his first gold bracelet and $398,567. Bilokur faced just that in this event. Among those he outlasted were Scott Seiver (12th – $30,516), Erik Seidel (11th – $30,516), Dan Shak (10th – $30,516), Barny Boatman (9th – $37,389), Richard Lyndaker (8th – $46,533), Pratyush Buddiga (7th – $58,851), Todd Brunson (6th – $75,681), Chino Rheem (4th – $131,705) and Alex Venovski (3rd – $178,434). Bilokur entered heads-up play with Florida cash game specialist Matt O’Donnell, who was fresh off a 5th-place finish in the a $1,000 event earlier in the series. O’Donnell held a sizable chip lead of over 8-to-1 over Bilokur, but after 106-hand battle Bilokur was able to fight his way back into the match, take the lead and ultimately seal the deal. On the final hand O’Donnell raised to 180,000 from the button and Bilokur called. The brought the 9 8 2 and Bilokur checked. O’Donnell moved all-in and Bilokur made the call with the Q J for a flush draw with and a gutshot, while O’Donnell held the A Q . The 9 was a brick, but the 7 completed Bilokur’s flush, sending O’Donnell to the rail as the runner-up with $246,310 in prize money as consolation.